PUBG Corp doesn't want to end up in a gambling situation like Counter-Strike: Global Offensive. In a statement today, PUBG Corp announced that the Personal Trade option would be going away in PlayerUnknown's Battlegrounds. Previously, any items founds in the game's item crates could either be sold on the Steam Marketplace or traded directly to other users. It's the latter option that's being removed for the time being. High rollers aren't as high anymore. "We’ve seen a few cases of players using the personal trade function to sell items using third party sites. This is essentially an abuse of the system. To prevent this, we're temporarily turning off personal trades while we search for a better solution. Once we figure out a way to prevent abuse, the restriction will be lifted," said PUBG Corp in a statement released today. It may seem odd that PUBG Corp is getting rid of personal trading, but the issue it's highlighting is one that's dogged other games with similar loot systems in the past. Basically, though the items are completely digital, supply and demand combined with the Steam Marketplace means that the items themselves have a dollar value that can be quantified. 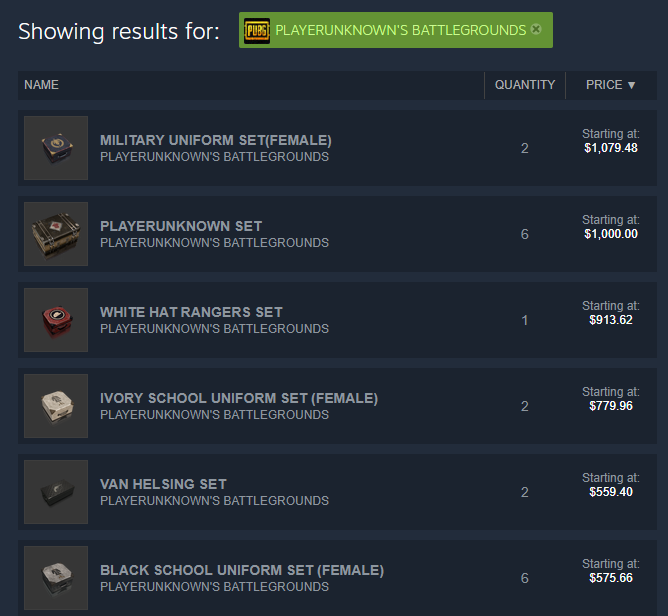 Limited edition clothes in PUBG go for high dollar amounts on the Steam Workshop; the limited Military Uniform Set crate for female characters is currently selling for $1,000+. Essentially, they work like stock trading. Current prices for PUBG items on Steam Workshop. Valve Software is still dealing with two lawsuits that allege the developer is a profiting from a third-party market that has risen up around skin sales in Counter-Strike: Global Offensive. Both lawsuits change Valve with not stopping online gambling, which is facilitated through these third-party sites. Our previous report cited a pool of $2.3 billion in wagers centered on Counter-Strike: Global Offensive skins. The first lawsuit aimed at Valve charged the company with profiting from illegal online gambling via CS: GO skins, while the second lawsuit added the additional wrinkle that minors can gamble via the system. "Valve is the barkeeper who allows illegal gambling operators to set up shop in its backroom and sell chips for a fee to customers on their way in, but claims it is powerless to stop the illegal gambling racket and benefits from having a packed house every night," said one of the lawsuits. "The value of Skins has gone up because of the gambling marketplace Valve created, sustains and supports, and Valve has directly profited from the sale of Skins, in addition to third-party business ventures such as a league based on CS:GO." Valve responded to these claims by sending a cease-or-desist notice to 23 Counter-Strike-based gambling sites towards the end of July in 2016. A number of those sites shut down in response or moved to different games. In late October of the same year, Valve found itself in trouble with the Washington State Gambling Commission over potential violations related to CS:GO gambling. In the beginning of 2017, Valve began blocking accounts using third-party sites to sell Team Fortress 2 items. Like the ongoing loot box situation, developers are finding themselves running afoul of government regulation. Yes, these are straight up gambling websites. This is PUBG Corp doing what it can to stay away from the controversy before it happens. There are already sites like DAPUBG, PUBG Empire, PUBGBets, and SkinJoker, who are using PUBG items for gambling purposes. PUBGBets already has a statement up on its site in regards to the changes. "Because of the last PUBG update, in-game items are temporary untradable. 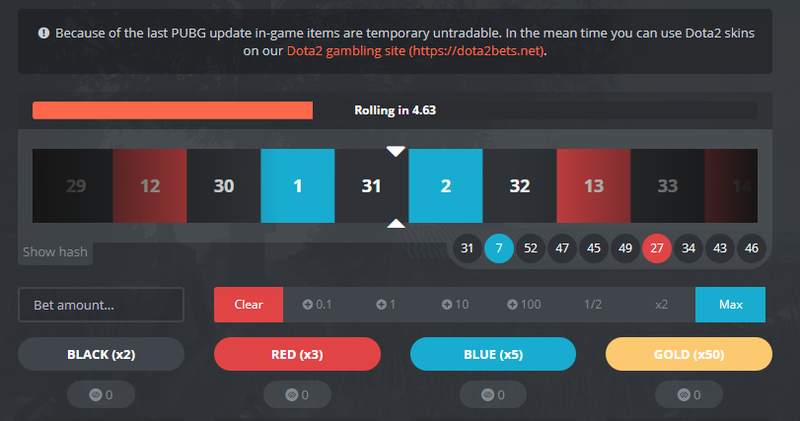 In the meantime you can use Dota2 skins on our Dota2 gambling site," says a banner on the site. It's worth noting that Dota2 is also a Valve Software title. Another site, CSGOEmpire, has also noted that PUBG items can't be trade in an official statement, though it notes it's looking for "alternative methods". PUBG trades are temporarily disabled due to an update: http://go.redirectingat.com?id=87431X1573192&xs=1&url=https%3A%2F%2Ft.co%2FuwkWKySuyfWe're looking into alternative methods for depositing but in the meantime instant CSGO deposits/withdraw are still available on Empire! 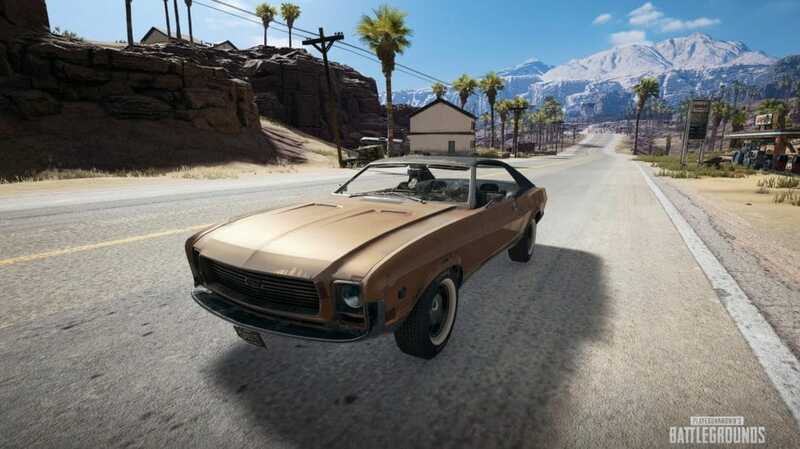 Tagged with News,	PlayerUnknown's Battlegrounds (PUBG),	PUBG Corp.,	Serious Business.